Super Smash Bros. can feel pretty unique, but it does inspire its fair share of projects that adopt a similar approach to party-friendly brawling. We've seen various games adopt the platform fighter style, and now one of those titles is targeting the Switch this year. 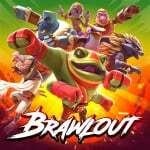 In this case it's Brawlout, which is currently in early access on Steam and is now confirmed to be targeting the Switch eShop for later this year. This was confirmed in a trailer confirming the protagonist of Hyper Light Drifter as the latest character. The following details are from its Steam page. It looks promising, though naturally pacing and balancing will be the biggest areas for developers Angry Mob Games to get right; we'll see how it turns out. Are you excited to see a game like this get confirmed for Switch? With thanks to SLIGEACH_EIRE for the heads up. I wonder if this means we're getting Hyper Light Drifter on the Switch at some point as well. Also, the developers totally nailed the Smash 4 aesthetic! I'd be willing to try it if the reviews are good, though the characters don't exactly look compelling. The nostalgia surrounding the Smash Bros cast is the biggest reason I love that series. This game doesn't really do anything for me. Every game like smash that's "supposed" to keep me busy only distracts me for about a week. Although this looks good, I'll wait for Smash for my brawling fix. I'd love to play the real Hyper Light Drifter, though! "Brawlout adds some extra mechanics seen in other fighting games." See ICONS. That's what you need to do instead of giving us the ken combo now that you're doing your own thing. I'm 50/50 on this, Rivals of Aether is incredible, so I dunno if I have a need for this. Looks real good nonetheless. Could be good. I look forward to seeing more of it. Now bring Hyper Light Drifter to Switch so I can finally play it. Even the name is a ripoff. I'd prefer to see Rivals of Aether on Switch, but this looks well done. So a Smash Bros. clone full of indie mascots eh, I'll try it if Shovel Knight, Trace, Mighty Gunvolt, or Meat Boy is in the game. I mean, the big draw with Smash is that we can all finally whoop everyone with Luigi and prove his dominance. That's why I got it for 64. I've always dreamed of an Indie Smash Bros. where all the Indie greats come together. With that said ... GIMME GIMME GIMME GIMME!!!!! Good for them. I might pick it up if it's cheap. Anyone know the price? If it's anything more than $20 I'm calling it quits. Not going to lie, the Drifter piqued my interest. Someone needs to try to get the indie developers to license out their respective IPs to create their own indie mascot brawler. If this game's roster included characters from Shovel Knight, Yooka Laylee, Shantae, etc., people would be all over it. Its a smash-clone, but one that looks a lot better then the other one (what was its name, Icons?)! Still, they are clones! I wasn't that interested in the game previously, but the idea of a Smash-style game full of indie stars sounds awesome. Get Shovel Knight in there! Eh, I'd rather get the Pokemon tournament port. If the roster is an all-star cast of indie games, consider me interested (although it does bother me that this seems to be an almost direct ripoff). If it's cheaper than Smash, sure. I'm not to big fan of Smash, but if this satisfies the tabletop itch to fight a local fight, then this'll do. How could a game like this rated PEGI 3 for a same Cartoon Violence level as Smash Bros ? Should be rated PEGI 7 / 12. Like others have said, it's about the characters. Remember the the lead-up to Smash games being released? Each week/month a new character gets revealed and it's a big deal. Remember how fun it is to speculate on who's in & who's out? Well this game doesn't have that. It'll probably be priced at $20 upon release but I probably won't check it out unless it's between $10-$15. I hope Nintendo just brings smash 4 to switch with more characters and stages. It was so good! Wow, HLD looks like a Cloud-Lucas-Bayonetta combo. Going to see some major nerfs after 2 weeks. Please let this be a sign the Switch is getting Hyper Light Drifter!!! This would be great if they could get some more indie game characters on the roster! They could do a Kart game with all the same IPs too. Day one for me, Hyper Light drifter was too good. Its the big reason for this game to exist. I've seen this game on Steam and it looks... terrible. The reviews are none-to-kind on there, either. Anybody interested in this game, I highly suggest checking out the user reviews on Steam. Looks pretty decent. I'm looking forward to seeing the end result. Problem is other than HLD I didn't really recognize any of the characters, and that is going to be the winning draw for me or not. I'll keep an eye on this. Brawlout looks decent, but the source material looks superior and will likely arrive on the Switch within the next 12 months, so I'll probably skip this. In all honesty this looks a lot better than the last time I saw it. I'll probably buy it when it comes to Switch. I should at least get some fun out of Hyper Light Drifter. It looks infinitely better and more original than Icons: Combat Arena... like that's much of an accomplishment. It has the same problem the original Smash Bros prototype had:bland characters(aside from Drifter).It should have a roster of popular indie characters,like Runbow. I worry about the balance in the game from looking into the video. I think BrawlHalla would be cool on the Switch too, the complete version that is. Oh and Remember guys we are getting a indie character brawler from Yachtclub as Shovel Knight dlc, we just don't know the date. Balanced or not, it looks awesome. But the thing that I absolutely need in order to buy is some kind of offline mode like an adventure or story mode where I can just mack out and pwn, reap my reward, earn new characters... Maybe even a story mode with friends... is that asking too much? I already like it more than ICONS. @getyourak Heart machine said they were looking into it. Gimme a physical release and we have ourselves a deal. Part of the charm Smash Bros has is the cast of characters whom all have history and we actually care about them.. These, not so much or at all. If this gets half the roster of Runbow; I'll actually need to look into getting it. I like the Hyper Light Drifter character but the rest of the characters look like Skylanders rejects. @19wonders Doesnt mean anything as this is taken from the Steam version and thats where Drifter began. I'm still waiting for a SEGA All-Stars fighting game. The gameplay looks good, but this isn't going anywhere with just Hyper Light Drifter as an iconic character. Somebody needs to let the developers know that they have the chance to really make a splash with a full on Indie Smash Bros. Super Meat Boy, Shovel Knight, Shantae, Hue, Commander Video, etc. We'd all eat that right up. Are hope they are more like a traditional fighter, like Street Fighter or something like that, rather than the way they are done in Smash Bros.
Can you play online stock matches without having to join a tournament? That's the biggest problem I have with SSB's online modes. As others have said, include Shovel Knight, Shantae, Child of Light, Axiom Verge, Beck, Gunvolt, etc and the game is a day-1 purchase! Maybe convince Nintendo/Camelot to allow them to use Isaac from Golden Sun, since they seem to have forgotten the franchise? This excites me purely because of Hyper Light Drifter! I freakin love HLD! !